The area had been settled by a man named David Baron in 1854 and growth was rather slow. A store and post office were in operation in 1890 and by 1906 the post office was discontinued. Mail was later routed from Thornton, Texas. By 1946 Odds had sixty citizens, one business, a school, and two churches. At one time Baptist and Methodist congregations shared a union church - the preachers saving souls on alternate Sundays. Odds school had been in the Little Brazos School District before it was consolidated into the Groesbeck ISD in 1965. School consolidations nearly always drained the lifeblood of communities and the population in 1967 was reduced to only 20. With no school or businesses, Odds was a ghost by 1990. 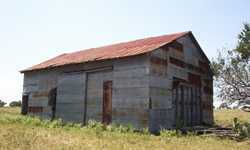 "What is left of the cotton gin my dad used many times in Odds." Subject: Odds, Texas and Odds, Kentucky. DEar TE, My name is Danny K. Blevins. I am an educator and author in Johnson County, Kentucky. I have looked at your site many times and I found it very interesting to find a Texas Ghost Town by the name of Odds, Texas. According to your site, it was named for Odds, Kentucky. You stated that you were unable to find anything about Odds, Kentucky and that maybe it too had become a ghost town. Well I just came back home to Montana from visiting my family in Austin. We took a trip up to see where Odds was at. This is what we found. From Kosse on Hwy7 & FM 339 go North West to FM 147, turn toward Marlin to FM 339, this road goes NorthWest again. At the corner of FM 339 and FM 147 is Odds. Ruins consist of a brick fireplace chimney, tin barn, concrete square and a large foundation with steps of concrete. There is a large red barn at the junction of 147 and 339 that says BUFFALO MOP. Odds, Texas was suggested by Bonnie Keeley of Montana, whose mother Thelma Beatrice (Tabor) Carlisle once lived in Odds.